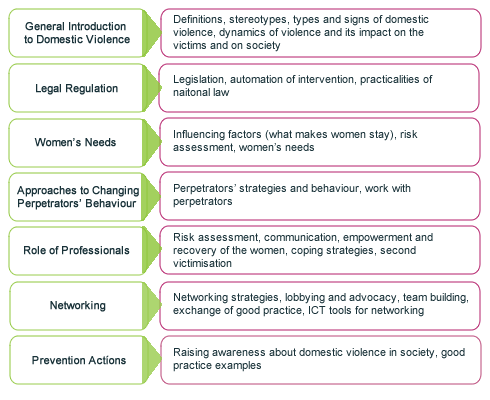 The central objective of the PACT training kit is on the one hand to deepen knowledge about domestic violence among professionals and on the other hand to promote a closer cooperation and networking of all relevant stakeholders at a European level by exchanging knowledge and practice with view to different intervention models. The structure of the training is based on a modular concept, meaning that the section and units of the course can be used independently and consists of face-to-face seminars being complemented by online modules. The training kit was piloted from March 2011. The highlight of the piloting phase was the two-day workshop in Lisbon in June 2011 to which two to three participants of national pilots were invited. The focus of the workshop was on risk assessment for survivors and for professionals, exchange of good practice as well as on new approaches from the field. One of the outcomes of the project is the e-learning platform, which will complete the face to face training. The learning and training platform is available in six languages (EN, DE, IT, LI, PL, PT) from March 2011, allowing the blended learning pilot to be conducted from march 2011 to June 2011. After this period the blended learning materials will be adapted to the needs of the participants. The e-learning platform is available here. You can ask for a guest account at our project office.